The short answer to why we’d trade order flow is that this is what prop firms do. I am not aware of any group of traders that get profitable faster than prop firms. You can use order flow to refine your existing trade method or you can use it on its own. Order flow cannot fix something that doesn’t work, so if you are trading based on moon phases, it won’t help. You do have to be realistic about what you can achieve with order flow. If you are nominally profitable, it can help. If you are losing most of your trades, then you should consider dropping what you do now and using order flow on its own. That might sound scary but lots of traders end up spending 10,15,20 years trying various methods of chart reading and not getting anywhere. Prop traders use order flow because they feel it’s the fastest and easiest path to profits for their trainees. 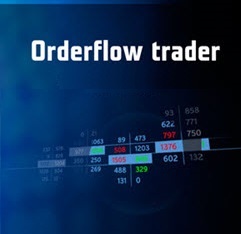 Order flow tools represent the only real way to see what other traders are doing – right here right now. Innovative tools like Jigsaw day trading. The main difference in approach between retail and professional day traders is that retail traders spend their time trying to guess what the market is going to do. Professional day traders trade what is happening right here, right now. That’s a huge difference in the way they learn to trade. If a market is moving up, a prop trader will buy it (obviously not blindly buying), when a typical retail trader sees a market moving up, they are looking for a chance to sell it. Not only does this mean they miss a lot of opportunities to join moves, it means they are always trading against the market. The concepts of support & resistance are very popular in the retail world and they can be interesting reaction points. That does not mean you have to trade there. It just means that if a market moves down to a support zone and then moves up, we might see an increase in participation which we can take advantage of. Trading support means buying a market that is moving down. That’s is a low probability proposition. Retail traders have accepted many concepts like “buy support, sell resistance” without really questioning them much. In the professional world, it’s more going with the flow.